The Republicans spew vitriol, while the Democrat explains democratic socialism on Saturday Night Live. Concord, New Hampshire—With only a matter of hours to go before New Hampshire’s first-in-the-nation primary, all eyes turned to Saturday night’s great debate. No, not the vitriolic hatefest that saw Republican candidates ripping into one another at St. Anselm College in Manchester. WGIR-AM radio host Jack Heath, a former New Hampshire television news director, accurately criticized the Republican debate as a manipulated national-news-network production that excluded at least one candidate (Carly Fiorina) who is running better in New Hampshire than some of the contenders who were on the stage. The GOP field’s eighth debate was a failed exercise in anger management. Ouch. Ouch. Ouch. The match went to Christie. The crowd booed. But Trump did not miss a beat. “That’s all of [Bush’s] donors and special interests out there,” he said. Then, in the middle of a presidential debate, the billionaire front-runner complained about ticketing. Trump was right. Yet, the crowd, which did indeed include a number of purchasers of influence, did not recognize that he has turned them into a punchline. The GOP debate was so cruel and unusual—and so frequently absurd—that it was unintentionally humorous. Analysts actually counted the number of times that Rubio robotically repeated the same cheap shots at President Obama. The better, and perhaps more influential, television on Saturday night inspired a different sort of laughter. This television was coming not from Manchester but from New York. 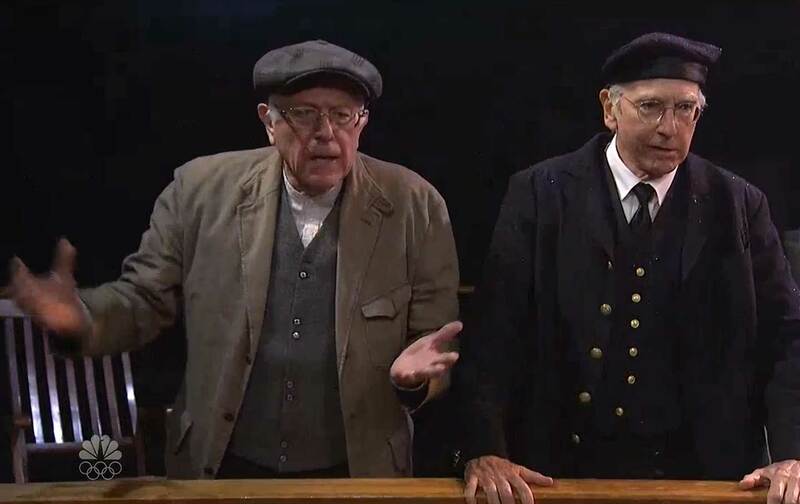 Vermont Senator Bernie Sanders pulled off the New Hampshire trail for a few hours to appear on NBC’s Saturday Night Live with comedian Larry David. “Enough is enough! We need to unite and work together if we’re going to get through this!” yelled Sanders, echoing his campaign themes. “Sounds like socialism to me,” replied David. “What’s the difference?” demanded David. “Yuge!” Sanders responded, mocking Donald Trump’s variation on the language. “Who are you?” asks David. “Yea, that’ll trick ’em,” responded David. The crowd roared with laughter, and moments later a deckhand announced that the ship had struck Liberty Island off New York. That was the main appearance for Sanders, although, later in the show, the senator and the comedian actually talked politics. “OK,” replied Sanders, who is maintaining a lead over former secretary of state Hillary Clinton in recent New Hampshire polls. How good will be determined by the voters on Tuesday. But there was no question that Saturday night went better for Bernie Sanders than it did for Marco Rubio and most of the other Republicans.